Routine cleaning is an important part of oral health care. In many cases, that simply involves brushing your teeth at least twice a day and flossing at least once, as well as attending regular dental cleanings at least once every six months. Sometimes, however, you might need more involved periodontal cleaning – also known as scaling and root planing – to address a more aggressive buildup of oral bacteria. At our Encinitas/San Diego periodontal office, we can perform specialized scaling and root planing, as well as ongoing periodontal maintenance, if necessary, to help you address an increased risk of gum disease, or control it if it’s already developed. Periodontal cleaning is called scaling and root planing because it involves carefully removing the plaque buildup on your teeth roots underneath your gums (scaling). Then, the procedure involves carefully polishing your teeth roots to make it more difficult for oral bacteria to accumulate on them in the future (root planing). Periodontal cleaning is more involved than routine dental cleaning, and therefore, it may take more than one visit to complete. 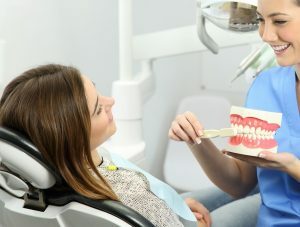 If your gum disease has progressed enough, then perio cleaning may be followed by a regular schedule of periodontal maintenance visits, as well. Routine dental cleanings are always necessary, even when your teeth are healthy, in order to prevent plaque from lingering on their surfaces. However, periodontal cleaning is only recommended when there’s an increased risk of gingivitis development, such as increasingly larger periodontal pockets due to plaque buildup under your gums. You may notice signs of gingivitis, such as redness, swelling, and bleeding in your gums, or your dentist or periodontist might notice the increasing size of your periodontal pockets during a routine visit. Will you need further treatment? Sometimes, receiving periodontal cleaning in gingivitis’ earliest stage may reverse the condition and help you avoid the need for further treatment. However, for many patients, gum disease is not reversible. After undergoing perio cleaning, you may require additional periodontal maintenance and treatment, such as laser gum disease treatment (also known as LANAP), pinhole gum grafting, or more. If you exhibit early signs of gingivitis, or are at an increased risk of it, then you might need periodontal cleaning (or scaling and root planing) to address it as soon as possible. For more information, schedule a consultation with Dr. Kania by calling her periodontal office in Encinitas/San Diego, CA, at (760) 642-0711.